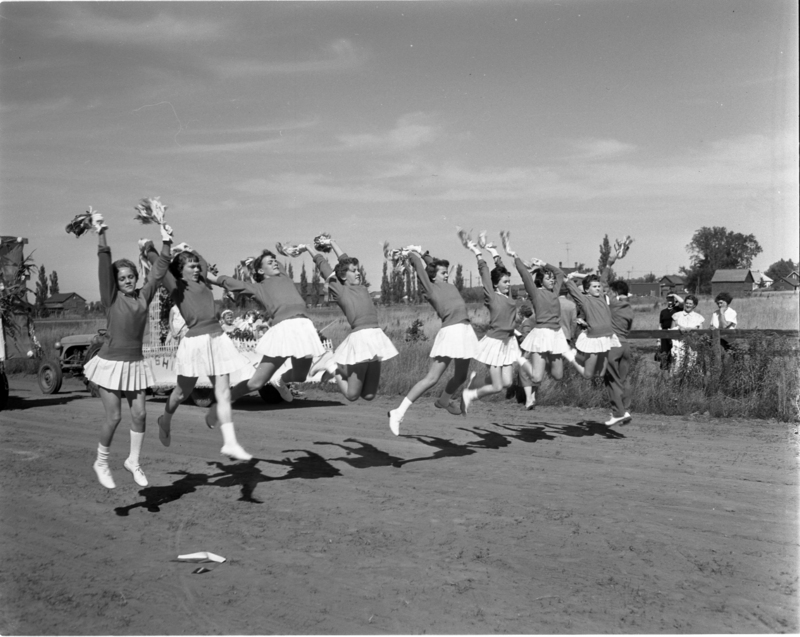 It must be wonderful to be young and full of the pep and vitality displayed by these Elmvale District High School cheerleaders at the recent Elmvale Fair. Girls of the school defeated the boys in a marching competition. Judges said they kept their mind on their work better than the boys. There’s always plenty to interest the ladies in the flower section of the many fall fairs now in this area. 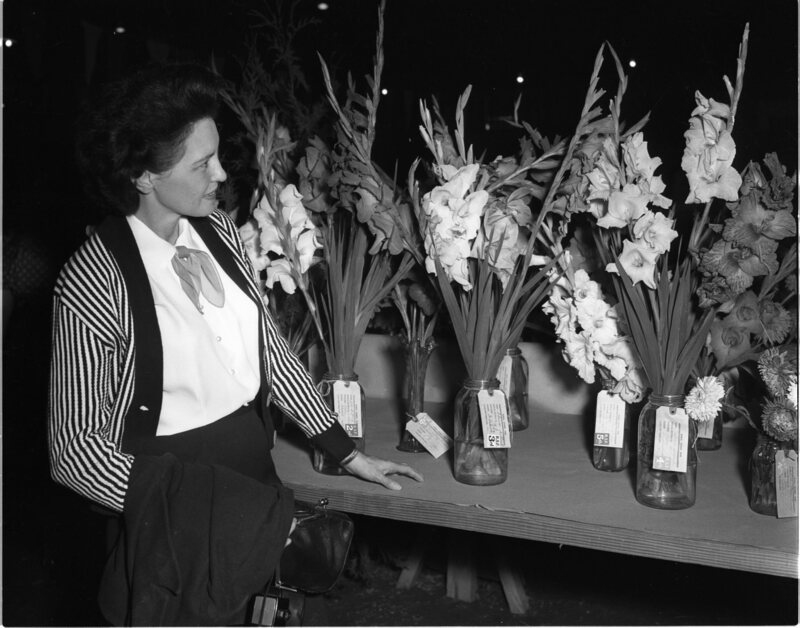 Mrs. Frank Robertson was interested in the gladioli display at Elmvale’s 99th annual fair this year. Coaching boys athletics at MPDHS is the (sometimes) happy task of the men above, seen lining up the week’s program. 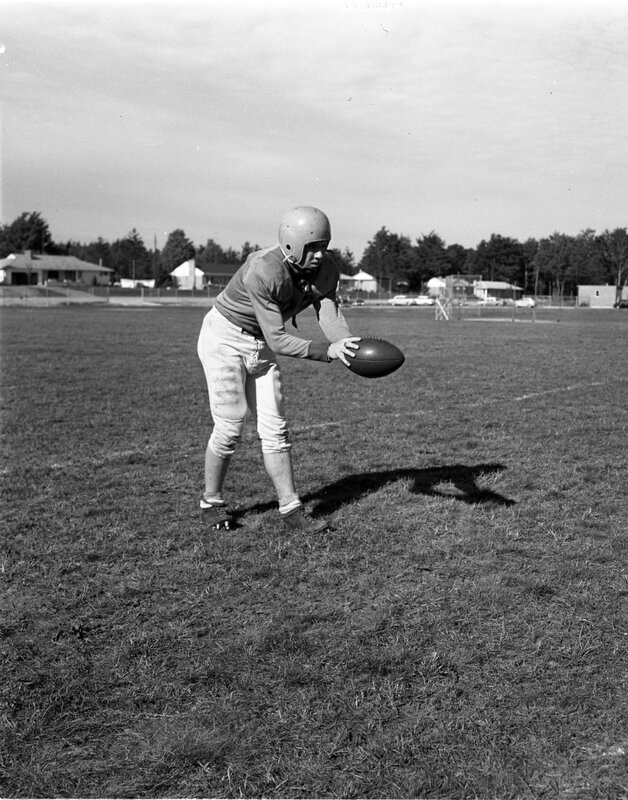 With track and field out of the way, for the time being, football and basketball now come into full swing. 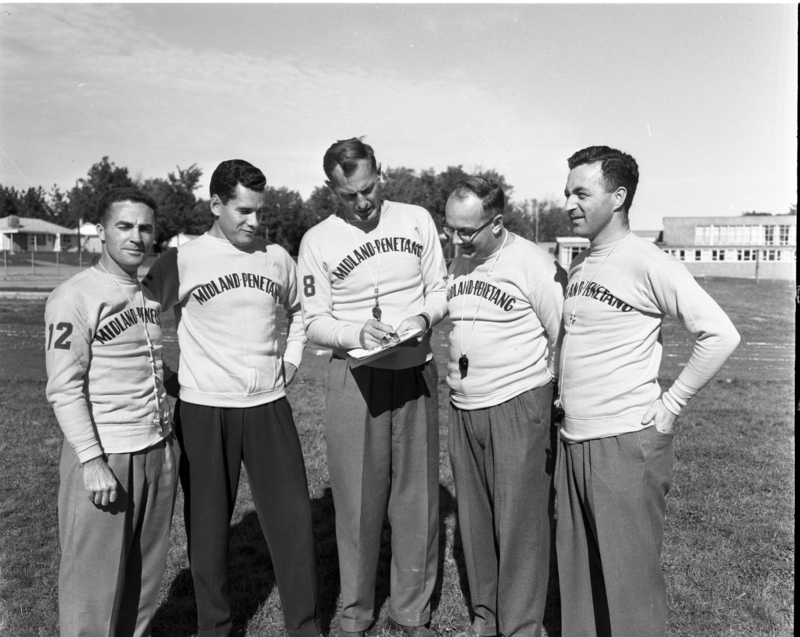 Left to right are Emile Blouin, assistant track coach; Douglas Swales, head coach in charge of senior football; W. C. Setterington, athletic director; Bill Kennedy, in charge of the junior football team and Perry Rintoul, head track coach. Midland Jaycees held their first fall meeting under a new executive last week. 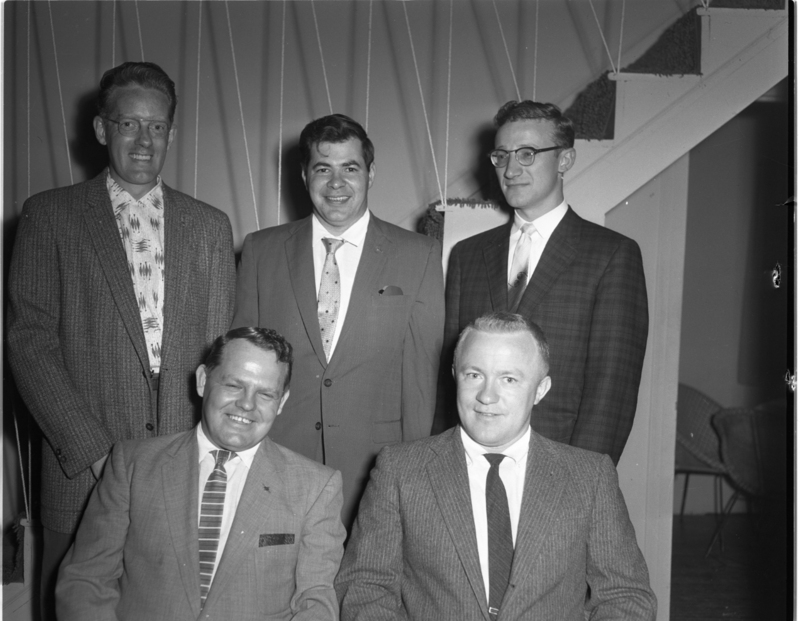 Seated are president George McLaughlin and first vice-president Peter Matts; standing left to right, second vice-president Bill Bennett, secretary Cliff Ornsby and treasurer Ben Westlaken. Natural gas officially came to Midland Wednesday afternoon when Mayor Charles Parker turned a valve in front of the new municipal building. 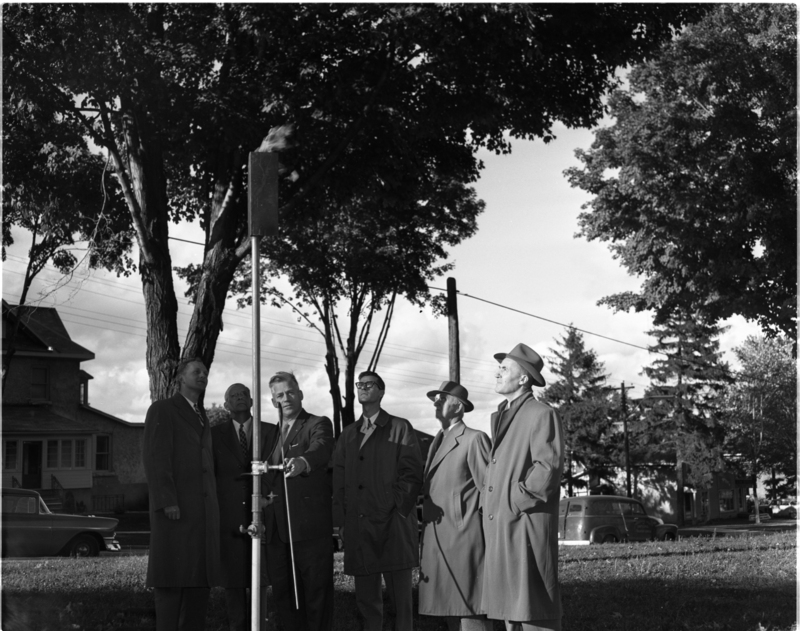 Looking on are F. W. Hurst, comptroller for Consumers Gas Company; C. R. Brewer, assistant to the general manager of Consumers Gas; Ian Hope, manager, Georgian Bay area; Reeve W. H. Keller and Alderman H. J. Beauchamp of Midland. Inside the new Penetang Arena work on the actual building and installation of the artificial ice making machinery is moving forward. The front of the structure has been improved in appearance by a coat of white stucco over the entire front. Windows cut in the front wall on the mezzanine floor level alleviate the blank look of the large expanse. In the interior, one finds sleepers already in place awaiting the arrival of the miles of pipe which will be laid to provide ice. Gravel has been added to the top level of the sleepers and, when piping has been installed, it will be covered with a layer of gravel, and sand. Future plans call for installation of a concrete floor over the whole surface. Hey, what goes on here, asked Midland’s Dan Dubbin, as he surveyed crystallized rear window of his car. The window was perfectly normal when Mr. Dubbin went in to work at 1 p.m. It looked like this when he came out. 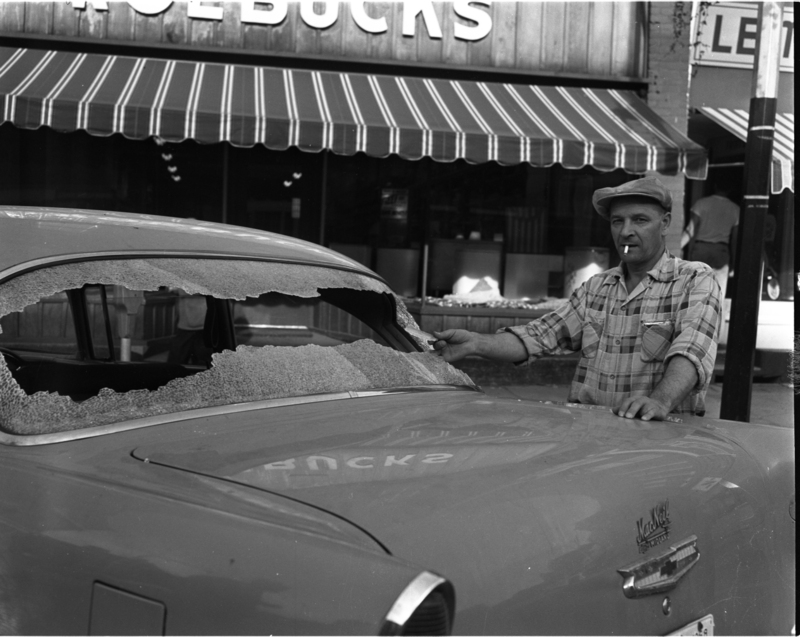 Damage was believed to be caused by a flaw in the glass. The top winner in Elmvale 4-H Calf Club’s achievement day at Elmvale Fair Sept. 23 was Mae White, right. Mae won the grand champion showmanship award and her calf “Sally” won similar honours. 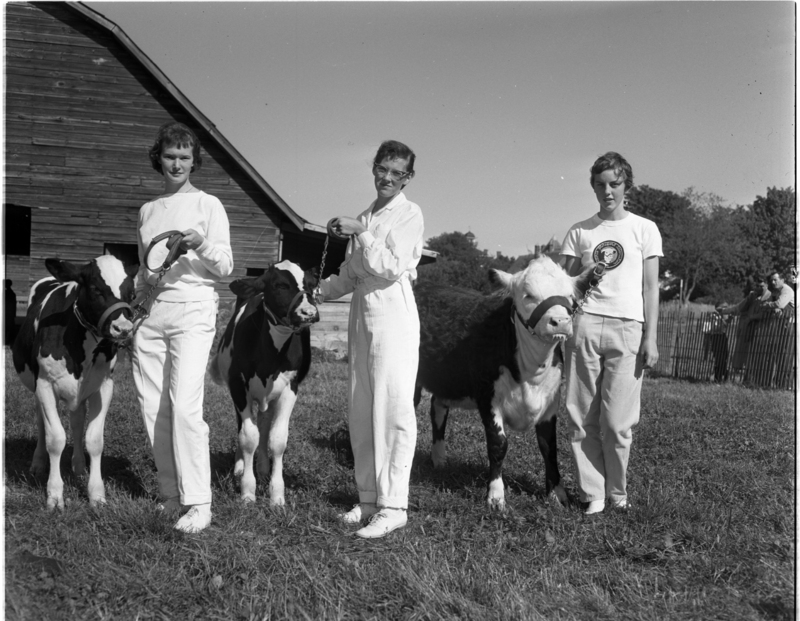 Other girls are Myrna Bell, left, who placed third in showmanship, and Anne Robertson, who placed second. Long tie-ups for traffic westbound on Highway 12 could result at the junction of the new Trans-Canada Highway at Waubaushene on weekends next summer. At present, the westbound traffic must await an opening to cut across the southbound lane of the Trans-Canada. That could be a long wait in summer traffic. It might also mean some bad accidents unless motorists take special care. It’s football time again and Midland – Penetang District High School is hoping for a repeat of the fine season enjoyed by both senior and junior teams last year. Two senior stalwarts above are Bill Offord, lower photo, who will do the passing, and Paul McDonald, who will handle the kicking chores this season for Coach Doug Swales’ Club. The team opens the 1958 season in Barrie this afternoon. They start them young at the Elmvale Fair, judging by the size of these children taking part in the calf club competitions for public schools. Left to right are John Archer, 10, Betty Strath, 8, and Greta Ruth DeGorter, 10. Greta won first prize in this division. This float, by pupils of S. S. 10 Flos (Crossland) won second place in the division for one-room schools in the Elmvale school parade Sept. 23. 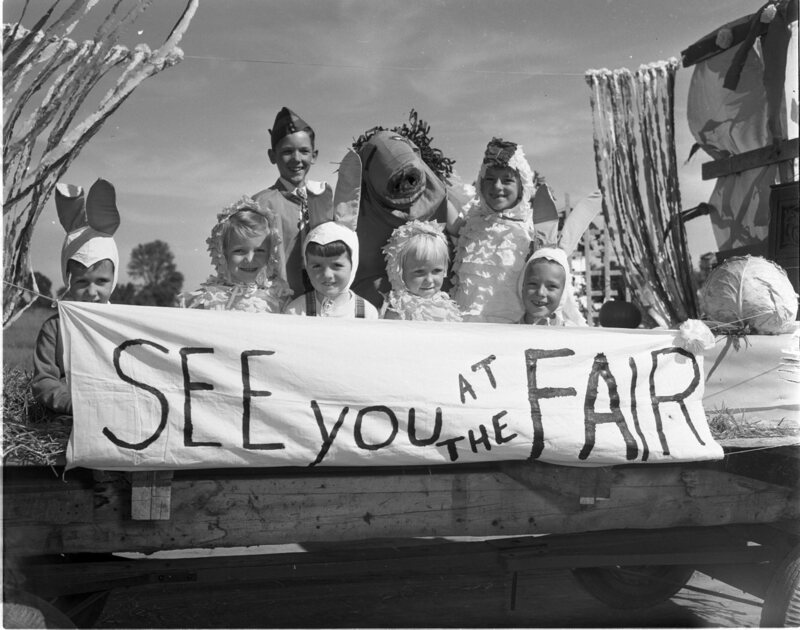 Children are left to right, front row – Paul Whitton, Wendy Lyons, Diane Handy, Bonnie Archer, Dougie Archer; back row – John Wills, Richard Anderson (hidden by horse costume) and Alice Archer. Keeping right up to date, Waverley Public School featured a space rocket for its float in the school parade at Elmvale Fair Tuesday. 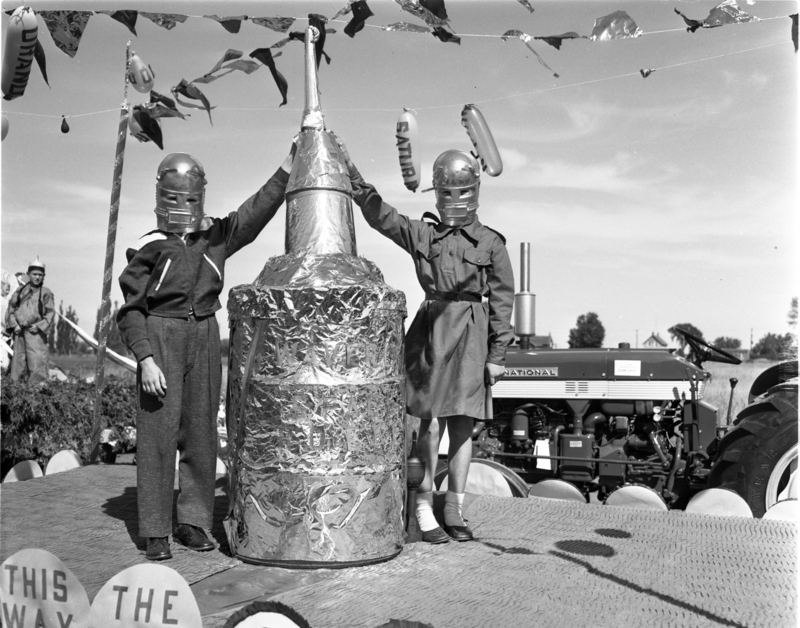 “Spacemen” are Dennis Brown, left, and Deanne Leonard. The Midland Free Press headline of October 1, 1958; Modern Federal Building in Offing for Midland. This newspaper was informed that some time ago plans had been drafted for an addition to the existing Midland Post Office. 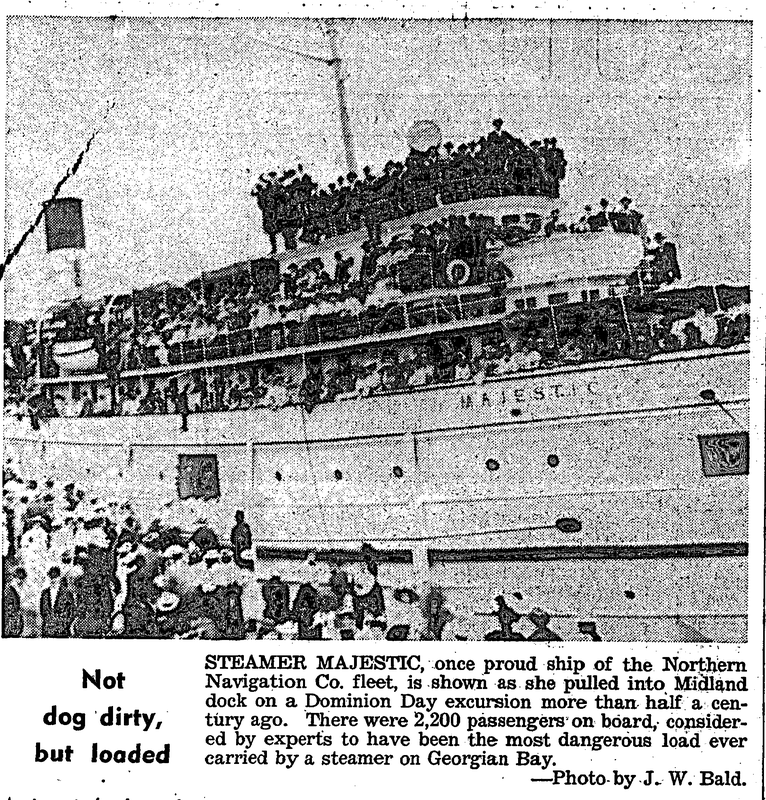 However, it was learned that the steamship inspection service and the customs department now housed in the post office, desired more office space. Also under consideration was the fact that the Unemployment Insurance Commission offices on King Street north are in rented quarters. In view of these situations, it is understood federal officials felt a new building rather than an addition, would be required. The County Herald headline of October 3, 1958; Tay Presses Town PUC, Wants Pressure in Mains. On the basis of advice it has received, from the township solicitor, Tay Township council feels Midland Public Utilities Commission is not “living up fully to the terms of its agreement to provide water to the township.” Tay council has instructed Clerk Ralph Dalton to write to P U C officials, requesting that the Midland commission take steps to install necessary pumps and any other installations required to provide adequate pressure in water mains west of Midland. Tay contends that because of the lack of pressure in the high school area, the Midland commission is not “living up” to this section of the agreement, the Tay clerk said. Council feels that this section means Midland has agreed to supply water at a pressure, excluding fire protection, which will provide normal operation of toilets and other services in that area, Mr. Dalton said. Council cited the high school as an example where water pressure is inadequate for toilet facilities. A pressure pump installed in the high school to overcome this problem was not functioning properly and had been a bill of expense because of sludge in the mains, it was stated. Mr. and Mrs. Leo Edgar, Midland, announce the engagement of their only daughter Grace Annette, to Mr. Miles Blackhurst, son of Dr. and Mrs. A. O. Blackhurst of Tillsonburg, Ontario. Wedding to take place in St. Margaret’s Rectory, October 25. 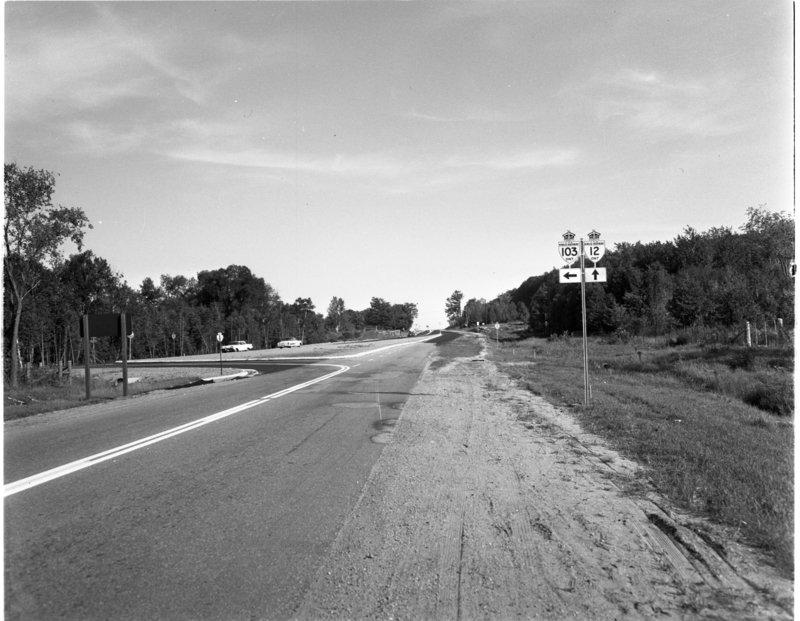 Ten Years Ago This Week – Coldwater council set its 1948 tax rate at 47 mills, three mills higher than the rate for the previous year. * * * Hillsdale United Church Women’s Auxiliary celebrated its 60th anniversary. 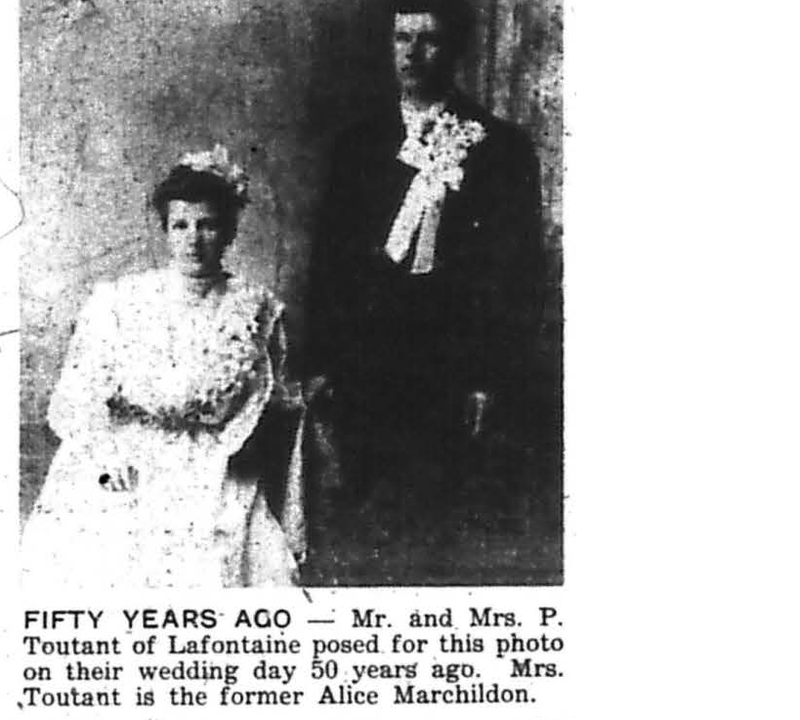 Among those attending the celebration was Mrs. M. Howarth, who had been a member of the W.A. since 1888. * * * Barrie athletes, both boys and girls, won the major honors at the 28th inter-collegiate track and field at the Ontario Athletic Training Camp on Lake Couchiching, The Barrie boys retained the Tudhope cup which they had won in 1947, and the girls won the H. J. Thompson trophy. * * * Midland firemen had to leave their annual benefit dance at Parkside to fight a fire which broke out in a double home at Bay and Fourth Streets. * * * Midland Public Utilities Commissioner Gordon Morris submitted a notice of motion at the PUC’s regular meeting, calling for the installation of water meters on all town services. 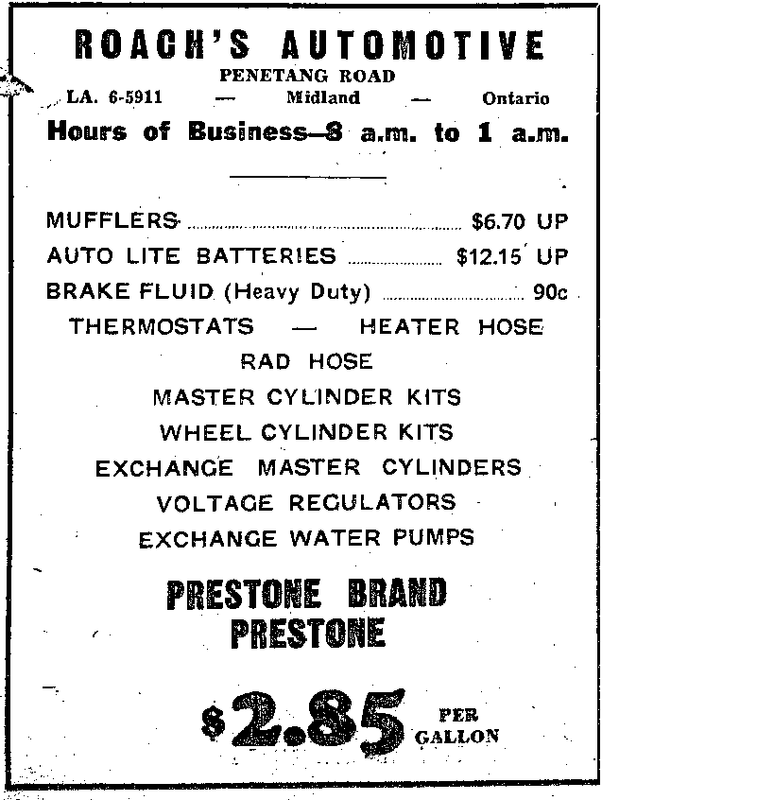 The meter system was to be implemented as soon as possible after Jan. 1, 1949. 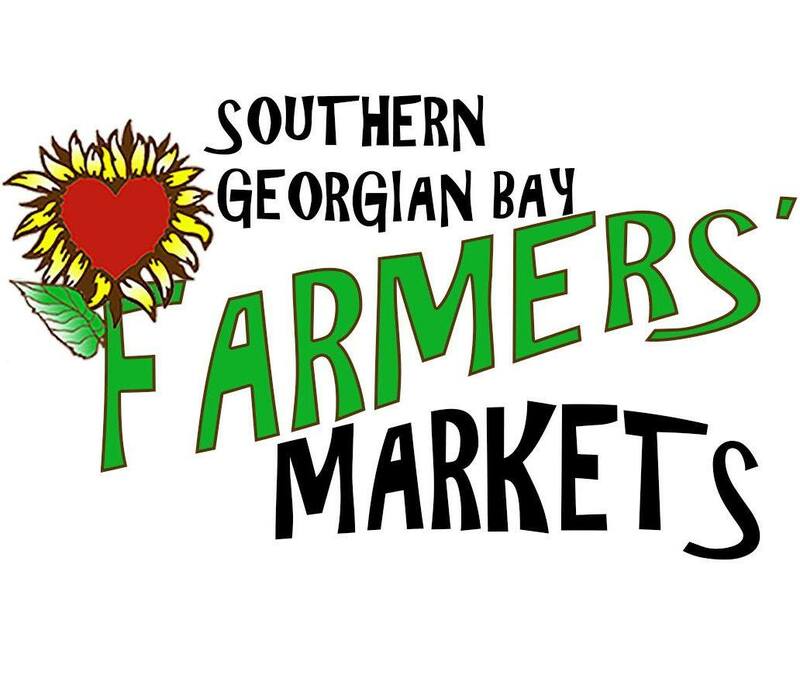 * * * Grain boat arrivals at Midland and Port McNicoll elevators were the heaviest in months; eight ships arrived at the two ports during a weekend. * * * Clarence Moore of Victoria Harbour was elected president of East Simcoe Teachers’ lnstitute, at the annual meeting of the association in Coldwater. * * * Rev. A. B. Cathcart of St. Mark’s Anglican Church was elected president of Midland and District Ministerial Association. Natural gas was officially turned on in the town of Penetang during a noon-hour ceremony at Memorial Park, Wednesday. 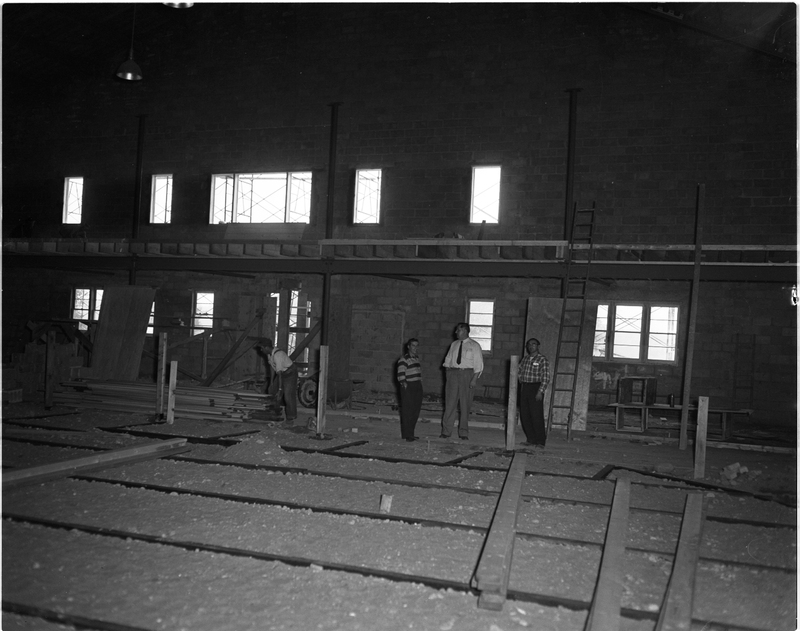 With officials of Consumers’ Gas Co., and the town of Penetang looking on, Mayor A. B. Thompson was accorded the privilege of lighting a huge jet symbolizing the arrival of the new fuel in the municipality. Midland and Victoria Harbour relatives are congratulating Harry Lidstone of Bracebridge, winner of the largest award yet given in a province-wide Hydro employee suggestion plan. The 39-year-old line foreman with the Bracebridge Rural Operating Area of Ontario Hydro was presented with a $1,500 cheque recently. His invention of certain tools enabling “hotline work” will save Ontario Hydro upwards $25,000. The maximum award under the suggestion plan is normally $1,000. A Hydro spokesman said municipalities all over Ontario will be able to avail themselves of the simple and inexpensive Lidstone technique for use on their own distribution lines. Eventually, it is expected, the idea will be taken up by electrical utilities around the world. A proposal that there be women school inspectors raised a few eyebrows at the convention of District 20, Ontario English Catholic Teachers’ Association September 19 at Martyrs’ Shrine. One of Canada’s leading herbalists E. Jefferis died Sept. I9 at St. Andrews Hospital following a coronary thrombosis. He was 91. Jefferis is best known in the Waubaushene area where he resided for many years and where one of his sons, Roy, still lives. He was born at Farnham England, March 7, 1867, and was the oldest of eight children of the late Mr. and Mrs. James Jefferis. He was around seven years old when his parents came to Canada. 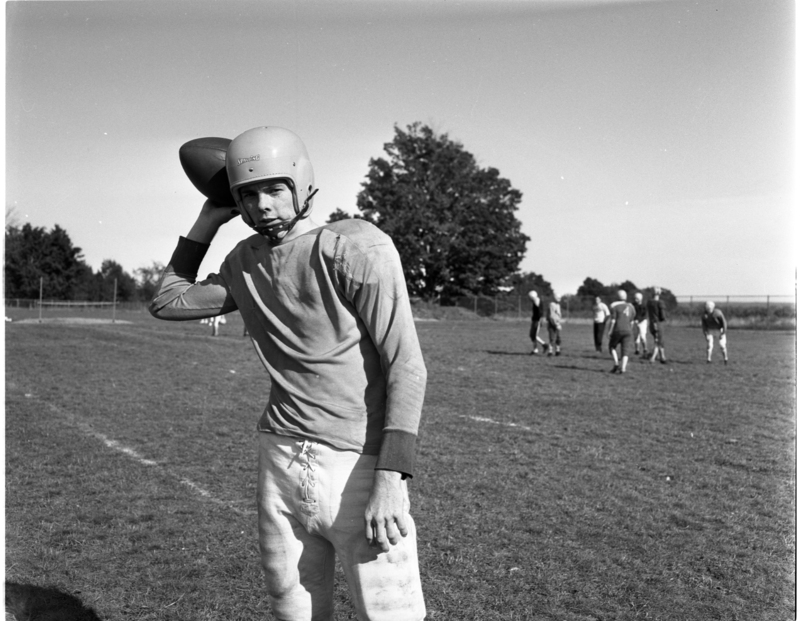 Settling first in Stratford, a short time later they moved to Orillia Township where he grew up. Later Mr. Jefferis was engaged in the lumber business at Gravenhurst, then at Rousseau Falls. While at Rousseau Falls he developed stomach trouble and found a prescription of an old Indian herbalist from Seattle which cured him as well as other people. The results were so favourable he decided to go into the business of producing herbal medicines. In the 50 years that followed, he became one of Canada’s leading authorities on the subject. Mr. Jefferis went to Waubaushene in I 895. Earlier in 1891 he married Sarah Anne McPeake of Dalrymple. They had six children, five of whom are living. The Jefferis’ had a general store on Pine Street in Waubaushene which Mrs. Jefferis ran while her husband looked after his herbal medicine business. When the store burnt in 1916, the Jefferis’ moved to Toronto. Mr. Jefferis continued to operate his business in Toronto for the next 28 years. 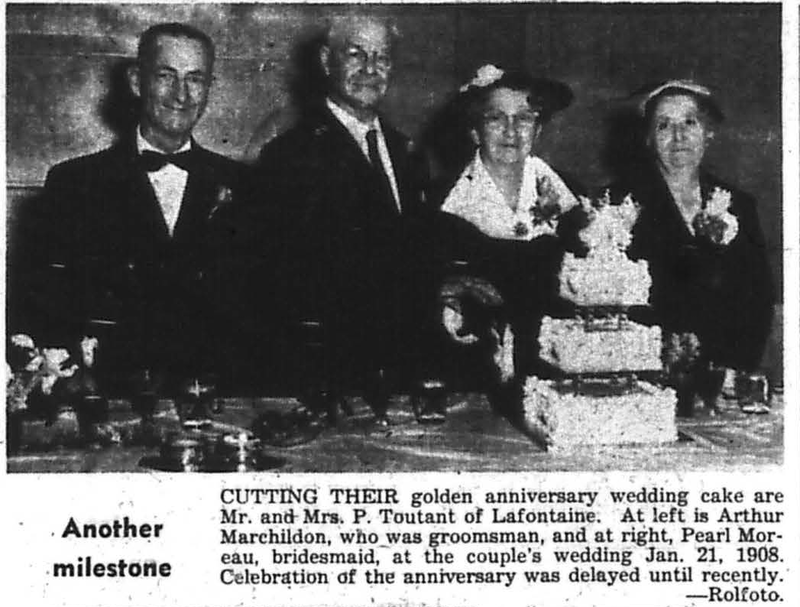 It was there that the couple marked their golden anniversary Jan. 14, 1941. Three years later they retired and returned to Waubaushene where Mrs. Jefferis died in 1945. Mr. Jefferis was also well known throughout Muskoka and North Simcoe as the owner of some of the best driving teams or his day. 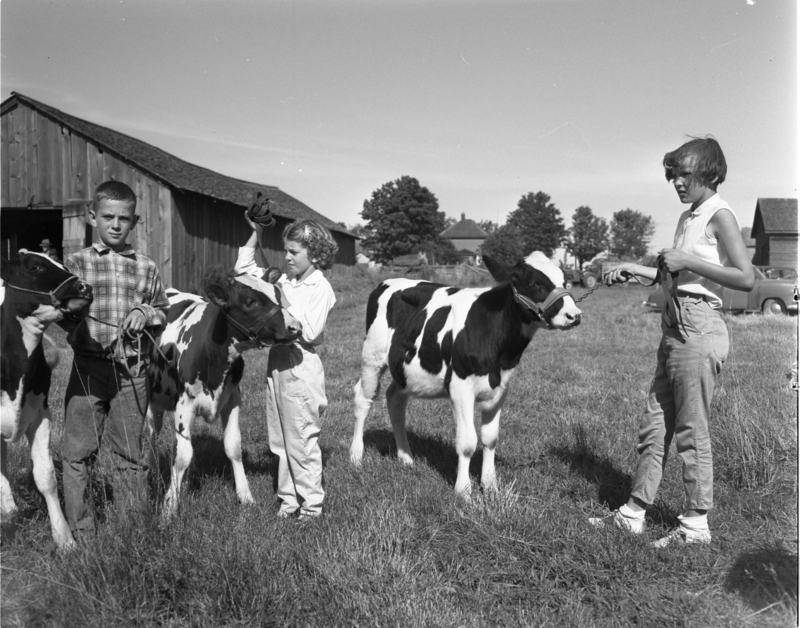 They won many honors at fairs throughout the area. FOR RENT, Service Station and 5 Car Garage, $10 per week. B.A. at Apto, Highway 27, North. Another one from the old files. No wonder there were so many disastrous maritime tragedies. This was before the lessons of Titanic.